It’s nearly seven years since the then-bankrupt Nordic nation froze many foreign exchange transactions. A thaw will start soon. The tactic worked but Greeks tempted by a southern version should be wary. Capital controls are hard to lift and only work with tough policy choices. 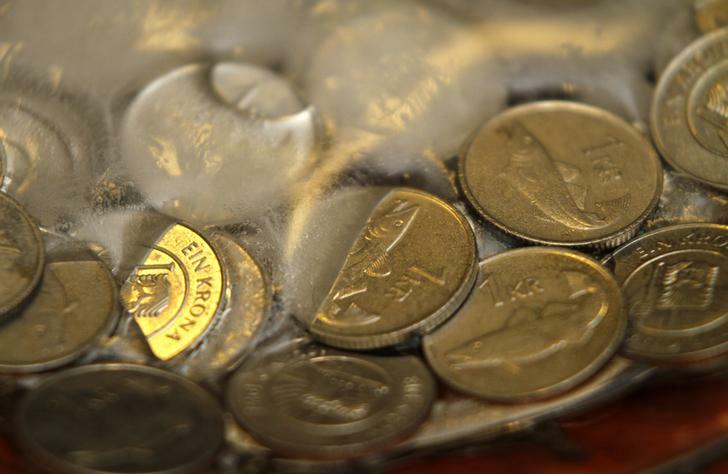 An illustration picture shows Iceland Krona coins in ice in Reykjavik March 6, 2012. Iceland laid out plans on June 8 to directly or indirectly tax creditors that want to take assets out of the country from banks that collapsed in 2008, the first step in lifting capital controls and rejoining the international financial community. The government proposed that creditors of banks would have to pay a 39 percent tax if they did not come up with “stability” conditions to which they all agreed by the end of this year. Investors in Icelandic assets such as government bonds could also get their money out of the country by selling crowns to the central bank. Alternatively, they could reinvest their capital in newer government debt that would be convertible out of crowns at maturity. Greek bank deposits fell by 5.6 billion euros ($6.15 billion) in April, European Central Bank data showed on May 29. The pace of outflows picked up, taking the balance to its lowest level in more than a decade.